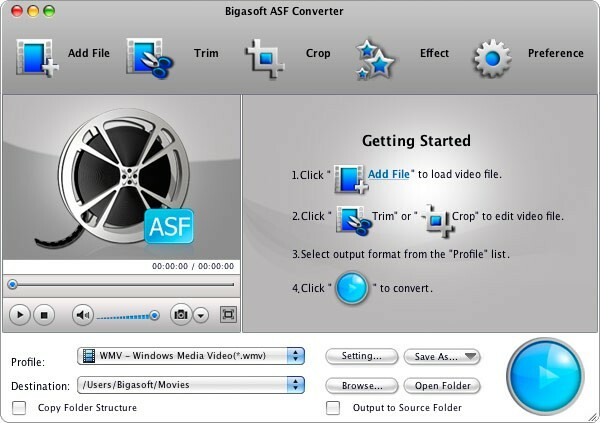 Bigasoft ASF Converter for Mac converts ASF file, HD ASF to any video and any audio to play ASF anywhere as well as convert various video to ASF or HD ASF. It optimizes ready video for many portable devices and media players. You can easily enjoy and play ASF, HD ASF on Mac, QuickTime, iPad, iPod, iPhone, BlackBerry, Android phones, Apple TV, PSP, PS3, Pocket PC, Creative Zen, Xbox, Archos, Droid pad and so on. Bigasoft ASF Converter for Mac has an ASF editor built in. It is dead easy to trim, crop, merge ASF video files, change aspect ratio, and adjust parameters, bitrates and so one. Bigasoft ASF Video Converter converts ASF, HD ASF to general video formats AVI, MP4, MOV, MPEG, MPG, WebM, H.264 etc, and HD videos HD AVI, HD MP4 and more. It is professional ASF Maker to convert all kinds video to ASF and HD ASF Video. The ASF editor allows you to cut video segments, crop black bars, merge several ASF videos into one, change aspect ratio from 4:3 to 16:9, adjust video effects, video volume, audio and video codec, add water mark and subtitles, and so one. Bigasoft ASF Converter for Mac has a built-in ASF player, so you do not need to download other players to play ASF on Mac. 9. It is available in multi-languages including English, German, French, Italian, Chinese and Japanese.